I’ve been steadily moving through David Copperfield — ignoring the Norton Critical Edition/Penguin Classics footnotes and bric a brac — and I’ve been grabbed by the story. I’m at the point where young Master Davy has been kicked out of his pleasant and loving house, after his widowed mother unwisely married a mean man who brought along his equally mean spinster sister, and has been sent to a brutish boarding school. I’m interested in finding out what happens to this poor kid. The prose in David Copperfield is dense, with tiny typeface that wreaks havoc on my 60-year-old eyes, but it’s an interesting read. In the book Charles Dickens provides lots of descriptive information about the world surrounding young Davy, and pointed social commentary in the guise of the innocent observations of the naive and trusting Davy in his childish years. I’m finding that I am enjoying those passages as much as the passages that advance the narrative arc of the novel. I’ve always enjoyed good historical fiction, because along with the story it conveys information about life in a different time and place, with different rules of conduct, different issues, and different social mores. David Copperfield is like historical fiction in that it provides a fascinating window into England during the Victorian period, with its distinctive culture and social strata. And in some ways David Copperfield is better than modern historical fiction, because it was written at the time, by someone who was actually there, observing in real time the details of a world and its people that have long since vanished. Of course, there’s no doubt that Dickens, like any good novelist, has thrown in some exaggeration for the sake of the story, but I have no doubt that his depiction of the harshness of British boarding schools, for example, with barbaric, ignorant masters eager to use the rod to beat an education into their youthful charges, is based on more than a few kernels of truth. I don’t know how well Dickens novels are selling these days and whether they are flying off library shelves, but I wonder if booksellers and librarians wouldn’t be well advised to pitch Dickens not as something that must be read to establish your intellectual bona fides, but rather as an interesting read for the historical fiction lovers of the world. This New York Times piece on the lonely death of George Bell is one of the most interesting and poignant pieces I’ve read lately. Interesting, because it dives deeply into the machinery of public administration and the sleuthing process followed when a person dies alone, and poignant, because George Bell died without family or friends. Bell lived alone in his apartment in the Jackson Heights neighborhood of Queens. He died there in 2014 at age 72. The authorities aren’t sure exactly when he died, because his body was found only after a neighbor noticed a rank smell and called the police. When the police arrived, in the middle of July, they found a body that had been decomposing for days in an apartment crammed with the kinds of possessions and mystifying mountains of garbage and other stuff that hoarders inevitably accumulate. The condition of the body was such that they couldn’t initially confirm it was Bell — which required some of the sleuthing described in the story — and he had no wife, or family, or friends to identify his remains. The Times piece is a long one. 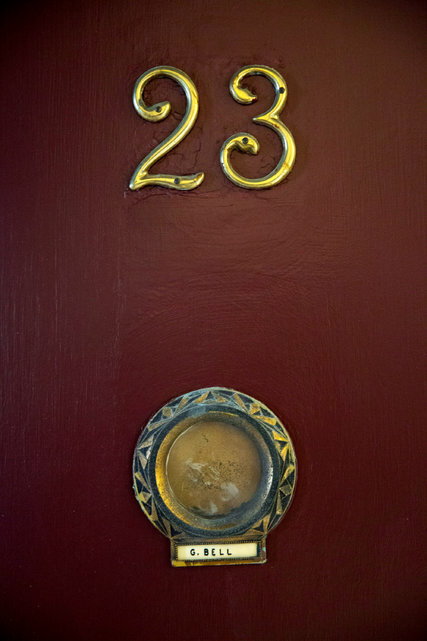 It carefully traces the steps that are followed when a person is found dead, alone, in New York City, and in so doing it also tells some of the back story of George Bell. He was an only child. He worked for a time for his father, served in the U.S. Army Reserves, and began working in the moving business. After his father died and his mother became crippled by arthritis, he took care of her. He drank, and was known to some friends as “Big George.” He never married, although he came close. He was a diabetic. He was injured at work in 1996 and began living on disability payments and a union pension — and one by one, he began to snip away his connections to the world. After thirty years of growing isolation, his last regular acquaintance was a person he had met at his regular bar. I’ve always thought the most terrifying part of Charles Dickens’ A Christmas Carol wasn’t the appearance of Marley’s ghost, or Scrooge’s visit to his gravesite, but the scene at his deathbed, where Scrooge lies, dead, alone, and unmourned, while his belongings are looted by people who felt no pity for him. In that respect, George Bell was like a modern-day Scrooge, dying without leaving much of a mark on the world around him. It’s a sad story, but also a compelling one. One of the workers whose job is to ferret through the apartments of lonely people like George Bell, looking for evidence of relatives, has drawn upon his macabre job to consciously try to build his circle of friends and his connections to the world. “I don’t want to die alone,” he says. 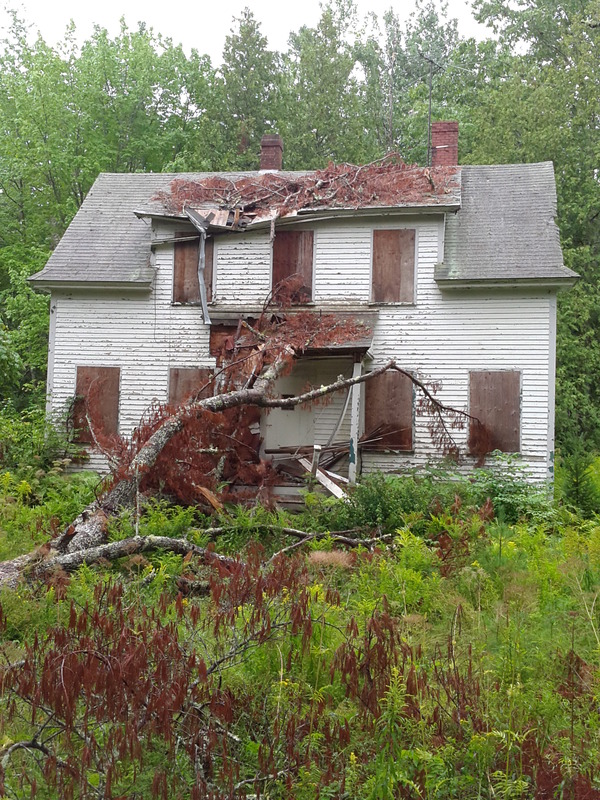 In one of the pretty neighborhoods around Blue Hill, Maine, this derelict structure stands, cheek by jowl with some lovely, well-kept, carefully manicured New England homes. Its roof and front porch have been partially caved in by the fall of an enormous branch that has never been removed, its windows are boarded over, and its yard is choked with huge weeds. Why? Our host said that no one in the neighborhood knows for sure — but something happened to make the house’s owner hate this house, and maybe the neighborhood, too. For 20 years, he said, she has let the house slowly decay, rejecting offers to buy it, paying the property tax bill in the nick of time, so that the decay could continue until the house looks like . . . this. What could cause someone to let this once tidy wooden home slide into ruin, and maintain such strong feelings for decades? It’s a fascinating topic for conversation, of course, and maybe a Dickens novel or two. Whatever it was, this poor house is paying the price. 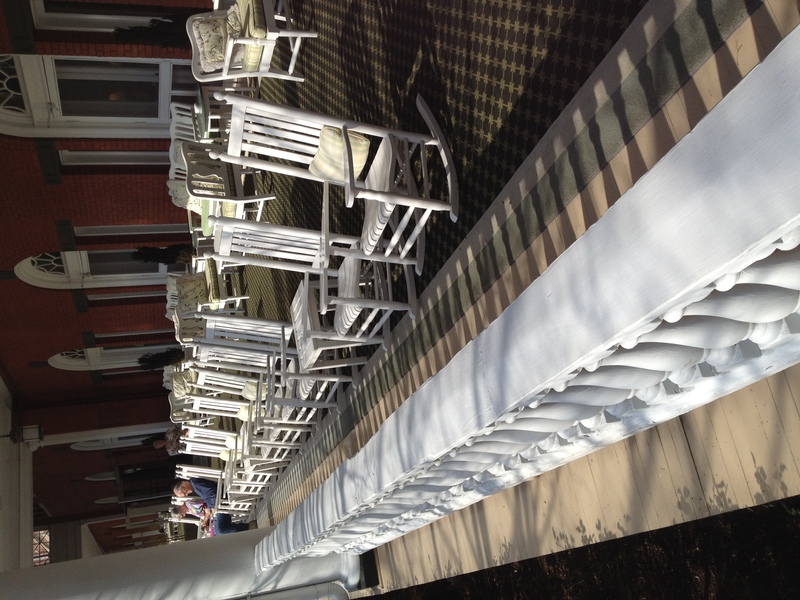 One final point about the Homestead: it has a fabulous front porch full of high-backed white rocking chairs. If, like Kish and me, you are an avid reader, there’s nothing like a rocking chair on a bright afternoon. We drank tea and read our books as the sun moved slowly across the sky; I was taking a fresh and enjoyable look at Dickens’ Oliver Twist on the recommendation of my friend the Liberal Kegler. We rocked gently in the sunshine and when I felt the warm air and faint smell of flowers and background noise lull me into drowsiness I leaned back, closed my eyes, and dozed with pleasure. There are worse things than a good book, a rocking chair, and a sunny day. Kish got two quarts of egg nog for the holidays. She did so because, some years in the past, one of the boys made the offhand comment that they had tried egg nog and it wasn’t bad. That innocent remark probably means we will buy at least one container of egg nog for the holidays, every year until the end of time. Mothers are just that way. The egg nog has not been touched by anyone. 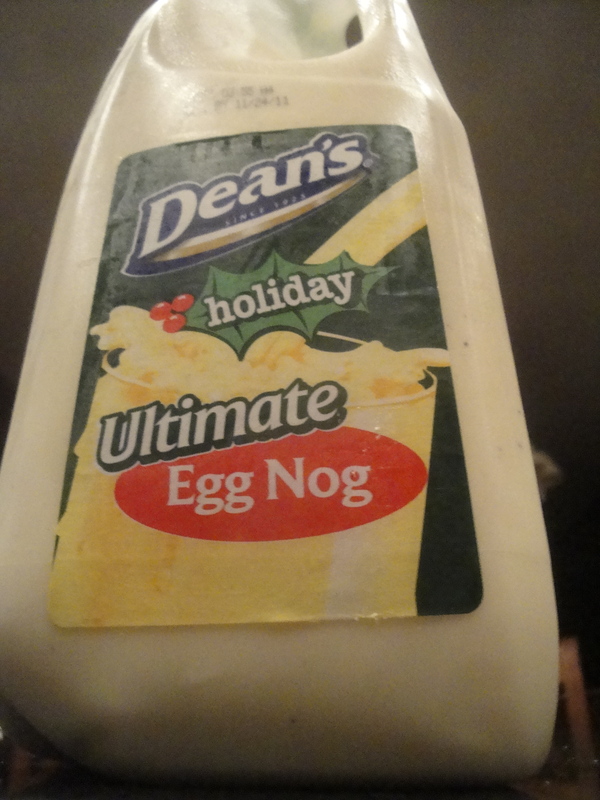 Perhaps the fact that the label describes it as “ultimate” egg nog is the reason. Regular egg nog is intimidating enough without having to deal with the “ultimate” variety — whatever it may be. Or perhaps it is because every rational person knows that egg nog is undrinkable. Its grotesque thickness, cloying sweetness, and overpowering odor . . . could anyone have come up with any less appealing holiday drink? Occasionally you will run across those egg nog defenders who look at you knowingly, lower their voices to a conspiratorial whisper, and say that everyone knows you need to spike the egg nog with, say, Captain Morgan’s Spiced Rum. That’s how they drank it in the old days, such people will say. Why do you think Old Fezziwig was so jolly in Dickens’ A Christmas Carol? Such comments simply confirm that the long-dead Brits who came up with the idea of combining milk, sugar, eggs, and rum were seriously troubled individuals who probably, deep down, hated the holidays. It’s bad enough to be left furry-tongued after a night of pounding rum; combine that rum with the awesome, near-permanent coating properties of egg nog and I’d be scraping my tongue for days. No one who really wanted to celebrate the holidays would develop a drink that is just going to compound and prolong the morning-after awfulness.